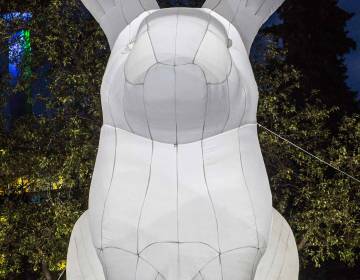 Huntsville, AL – Downtown Huntsville will soon welcome a global invader – in the form of 23-foot-tall inflatable illuminated Rabbits. Arts Huntsville, in partnership with Downtown Huntsville, Inc. and sponsor Toyota Motor Manufacturing of Alabama, is bringing whimsy and delight to downtown Huntsville this October with Intrude, a traveling public art installation by Australian artist Amanda Parer. Huntsville joins the ranks of Denver, Seattle, Singapore, Sydney, and Berlin – and other metropolitan destination cities – to host Intrude. Artist Amanda Parer created the towering rabbits to highlight the invasive nature of the species in her native Australia. Rabbits were first introduced to Australia by settlers in 1788 and have since caused a great imbalance to the country’s endemic species. The rabbit also is an animal of contradiction. Rabbits represent the fairytale animals from childhood – a furry innocence, frolicking through idyllic fields. Intrude deliberately evokes this cutesy image, and a strong visual humor, to lure you into the artwork and then reveal the more serious environmental messages in the work. Intrude will be on display to the public Friday, October 19th through the 28th in Big Spring Park East and West. The rabbits range from 10 to 23 feet tall. The public is welcome to gently interact with the bunnies and share their experience with the exhibit using the hashtag #IntrudeHsv. The exhibit will coincide with a calendar of special events, starting with the annual LIT: Light + Innovation + Technology festival. This year LIT has been expanded to a two-day event, starting with a Party in the Park on Friday, October 19th and the large-scale light projections on Saturday, October 20th. Arts Huntsville encourages the public to stay tuned for more details about the #IntrudeHsv exhibit by following @ArtsHuntsville on Facebook, Instagram, and Twitter and at artshuntsville.org.